For years now, we've been hearing about the growing obesity issue that is affecting the United States, and more and more western cultures being affected all the time, with scientists all putting in their penny's worth about the cause. When I went over to the US the first time in 1993, I was amazed at the sheer size of the soft drinks people could buy (and get refilled for a fraction of the cost - 7-11, I'm looking at you) and have believed ever since that that's probably the biggest contributor to the growing number of fatties. 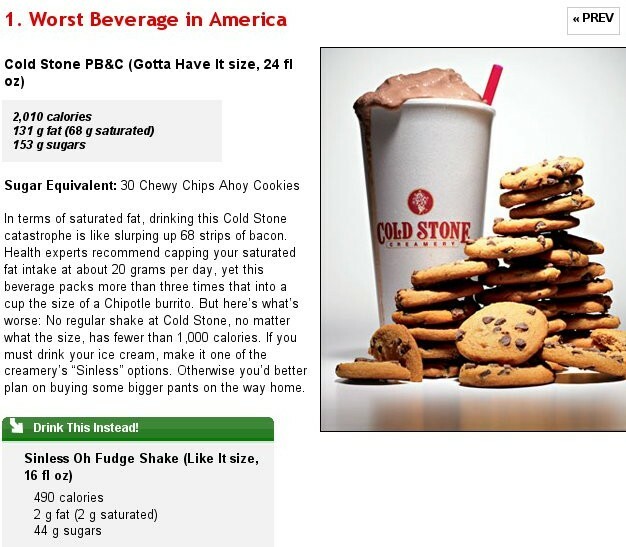 Yes, you are reading that correctly: 2010 calories, 131g fat (68g saturated) and 153g of sugar per drink. ONE 710ml milkshake (do you really need a milkshake that big?) has more calories in it than the recommended daily allowance for women (though this is now open for discussion). Who on earth is going to consume only a single milkshake all day? On a slight tangent, if you've got a spare hour and a half, take some time to watch Sugar: The Bitter Truth (on YouTube).